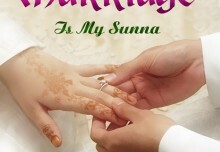 Understand Al-Qur'an Academy > Articles > Will I Be Forgiven? How do you deal with your sins? Do you take them lightly, or do they make you feel heavy and very, very guilty? Let’s learn about real tawbah and get motivated to turn to Him again, and again, and again inshaa Allah! “Do tawbah!” he shouted at his son. Tawbah often is simply translated as “repentance,” but it has a much deeper meaning and literally means “to return to” or “to retreat.” Tawbah doesn’t mean you despise yourself! Every sin is a chance and signal that you can grow closer to Allah ‘azza wa jall! Tawbah is one of the most beloved acts of worship. Shaytan tries to prevent you from turning to Allah in two ways: He sometimes makes you not care about tawbah at all by tricking you into thinking too lightly of your sins. At other times he tries to make you feel unhealthily guilty by telling you that your sins are just too big or too often repeated and that you should feel ashamed to turn to Allah. In this way he makes you start despising yourself, doubting Allah’s love for you, and sometimes even giving up on doing tawbah and getting even more involved in sins because you are losing hope. Shaytan’s mission accomplished! Now, what should you do? 1. Don’t put limits on the mercy of Allah. If you think that your sins are too great or too many for the forgiveness of Allah, you are subconsciously limiting the mercy of Allah to human standards. Allah is At-Tawwaab, the Oft-Returning, to those who turn to Him. The question is not will He forgive me; the question is, will you turn to Him? So don’t let guilt keep you away from turning to Him with heart and soul after you sin. Focus on His greatness instead of on your sin, and move on! If Allah enabled you to feel you want to do tawbah, thank Him because it is a blessing from Him to you. Allah ‘azza wa jall says: Say: ‘O ‘Ibaadi (My slaves) who have transgressed against themselves (by committing evil deeds and sins)! Despair not of the Mercy of Allaah, verily, Allaah forgives all sins. 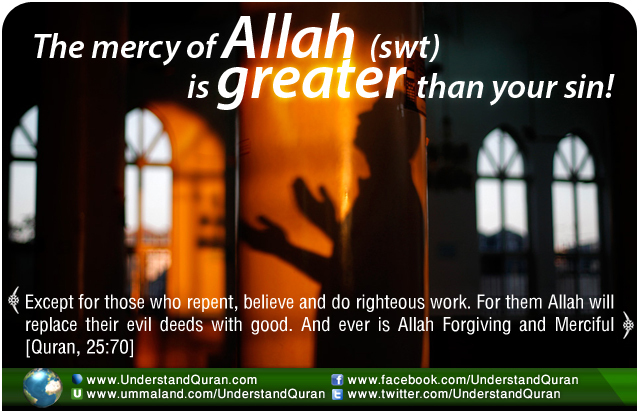 Truly, He is Oft‑Forgiving, Most Merciful. [Quran, 39:53] Read the Quran, so you can learn about His promises, as He does not break His promises. And His promises will motivate you in never despairing and will increase your love for Him! 3. Follow up a bad deed with a good deed straight away. Let’s say you just shouted at your spouse, or even gossiped. Make it a habit to turn to Allah straight away (however “fake” that might feel to yourself at first) and for example say instantly ‘astaghfirullaah wa atuboo ilayk’ ( I seek forgiveness from Allah and I turn to You). Then do a good deed straight after. The Prophet salallahu ‘alayhi wa sallam said . . . and follow up a bad deed with a good deed which will wipe it out . . . (At-Tirmidhee) So when you sin, for example, just open the Quran and read even one ayah– plus you get ten hasanaat per letter— or (go online) and give sadaqah straight away! 4. Be encouraged to turn to Him again and again. 5. Try to compare your misdeeds to His blessings. How to make your heart repent? Try to think about all those sins you committed from puberty until now, like the sins of your body (like lying, gossiping) and the sins of your heart (like envy, arrogance). Also neglecting your duties (like disobeying your parents) as well as neglecting your acts of worship (like delaying your prayer). Now try to count the blessings of Allah regardless of all your misdeeds and you will realize what a beautiful Lord you have! Inshaa Allah this will open your heart to tawbah nasooha (sincere tawbah)! 6. Pray the tawbah prayer. The Prophet said: Whenever one commits a sin, and then performs ablution perfectly, and prays two rakah wherein he seeks the forgiveness of Allah He will forgive him. [Ahmad] What a treasure! When you sin, try to pray these two units of prayer (salat ul tawbah) straight away or at least as soon as you can and don’t let Shaytan tell you differently! O Allah, make me among those who turn to You in repentance, and make me among those who are purified. [An-Nasaa’i] Put it on a sticky note on the wall where you do wudhu so you don’t forget, inshaa Allah! So whenever you sin, remember the formula of success mentioned in the central ayah: Repent, believe in Allah, and His Mercy, and do good deeds and Allah ‘azza wa jall will not only forgive you, but even replace your bad deeds with good deeds. Laa ilaaha illAllah! May Allah make us of those who turn to Him sincerely again, again, and again. Ameen. THE AYAH JOURNAL is dedicated to inspiring you to open the Quran every day, pick one ayah, and apply it to your own life by making acting on that ayah your mission for the day. Let’s bring back the message of the Quran to our daily lives! Check www.facebook.com/ayahjournal for examples. Tasmiya February 14, 2014	Log in to reply. Jazaki Allahu khairan sister it’s a vry lovely article and inspirational too. All my best wishes to your success. Aisha February 14, 2014	Log in to reply. Umar Bashir February 15, 2014	Log in to reply. May ALLAH bless you! Ameen. Yaqoob Ali February 15, 2014	Log in to reply. AllAh(swt) Accept your efforts for conveying his message to Muslim ummah. Allah(swt) Keep yourself and your family happy. Ameen YARABULLALAMEEN. TARANNUM February 15, 2014	Log in to reply. Kaleem Ahmed Siddique February 16, 2014	Log in to reply. Jazakum Allah. Very nice article. bloom princeton February 16, 2014	Log in to reply. umme Zaib February 17, 2014	Log in to reply. Ma shaa Allah! Just love your articles. Umm Ajwad February 19, 2014	Log in to reply. Beautiful words of reminder. Jazakaalhu chairman for sharing. Basharat February 23, 2014	Log in to reply.